By now, you probably know aaaaall about Ben & Jerry's famed Cowmobile and that time they made the world's largest ice cream sundae (if you didn't, it's all right here -- you're welcome). But what you don't know is how the actual Ben & Jerry feel about all the joy they've brought to people over the years, and who their favorite Game of Thrones character is. Fortunately, they conducted an AMA (Ask Me Anything) on Reddit yesterday, and everyone learned a whole heck of a lot. Here are some highlights. On Phish Food's "Chocolatey Shaped Fish"
Phish Food is one of Ben & Jerry's most successful flavors, but it's likely that people are so blinded by joy when they see it in the freezer that they haven't read the label in a while -- it actually says it contains "Chocolatey Shaped Fish," which, uh... can fish be shaped in a chocolatey way? Ben Cohen responded to this observation by remarking, "It's not said quite right. But the important thing to know is that when you DO lick the fish, you find the fish are smiling." The dudes are expanding their jam- and/or caramel-stuffed Cores lineup with a few new offerings, and will be announcing them officially sometime next week. We're waiting with (heavy) bated breath. All their ice cream is made in Vermont, so you'd think it'd be a logical conclusion that Ben & Jerry would incorporate the state's most famous product (... political nonpartisanship?) into their ice cream. But, according to Jerry, "unfortunately, very few people purchase" maple-flavored ice cream. Maybe try political nonpartisanship instead? Their favorite Game of Thrones character is "Dinklage"
These dudes know what's up. Except his actual name, kinda. The dudes didn't divulge exactly what their favorites were, but they lamented the fact that both are now in the Flavor Graveyard. Apparently, they have very little control over what gets sent there -- it's all based on what sells and what doesn't. 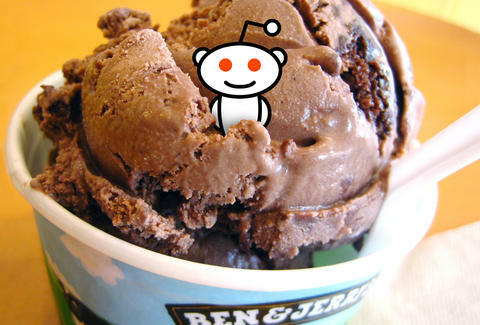 Since selling the company to Unilever in 2000, Ben & Jerry are mostly involved in a consulting role, as well as just being themselves and, subsequently, the face of the company. On "Ben & Jerry's babies"
In Vermont, there is a phenomenon known as "Ben & Jerry's babies," wherein tykes whose Moms rely heavily on a diet of the ice cream tend to be a little more, uh, "robust" than usual. This fact was undisputed by both. Adam Lapetina is a Food/Drink staff writer for Thrillist, and goes through roughly a pint a week of this stuff. Read his musings at @adamlapetina.